Meet Derek Neal. The winner of the inaugural Sam Menacker Cutting Edge Invitational and new number one contender for Mike Outlaw’s Cutting Edge Championship. A match with will take place September 15th at Grapplemania 3! We caught up with Derek Neal, the winner of the very first Sam Menacker Invitational, and new Number One Contender to Mike Outlaw’s Cutting Edge Championship. We caught up with “Unbreakable” Micheal Elgin after his battle with Jake Dirden at The Sam Menacker Invitational. Heres what he had to say. Savanna Stone left the #StoneNation shocked at her new aggressive attitude at the Sam Menacker Invitational. We attempted to get some answers…and were left even more shocked! 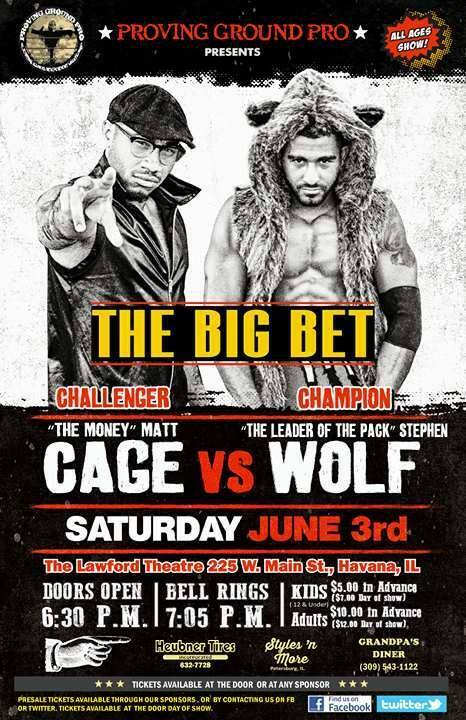 What an amazing night on tap for THE BIG BET……”The Money” Matt Cage gets a final shot at the Proving Grounds biggest prize when he takes on “Leader of the Pack” Stephen Wolf for the PGP Franchise title….Meanwhile, I feel pretty confident with Team Brady winning me a case of frosty cold PBR from Team Jesse in the soon to be classic best of 5 team event, THE BIG BET!! 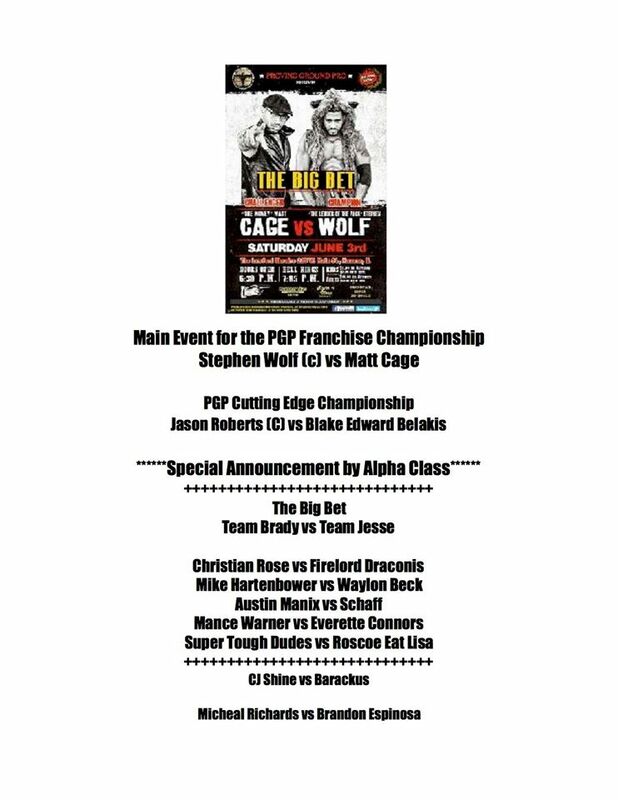 !gest prize when he takes on “Leader of the Pack” Stephen Wolf for the PGP Franchise title….Meanwhile, I feel pretty confident with Team Brady winning me a case of frosty cold PBR from Team Jesse in the soon to be classic best of 5 team event, THE BIG BET!!! Win…Lose… or Draw….The only 2 time and longest reigning Franchise champion in PGP history will put the belt on the line for the final time in the Proving Ground on December 17th at MIRACLE ON MAIN STREET….. The NWL has signed Jake ( Jack Foster in NWL) to an exclusive contract starting in January of 2017. We at Proving Ground Pro feel that they made a wise decision and wish a huge success in the future for both the NWL and Jack Foster (Jake Dirden). It all comes down to this, Jake Dirden retires as champion or passes the torch to “BuckNasty” Bucky Collins, either way you’ll be witness to Proving Ground Pro history in the making at MIRACLE ON MAIN STREET. 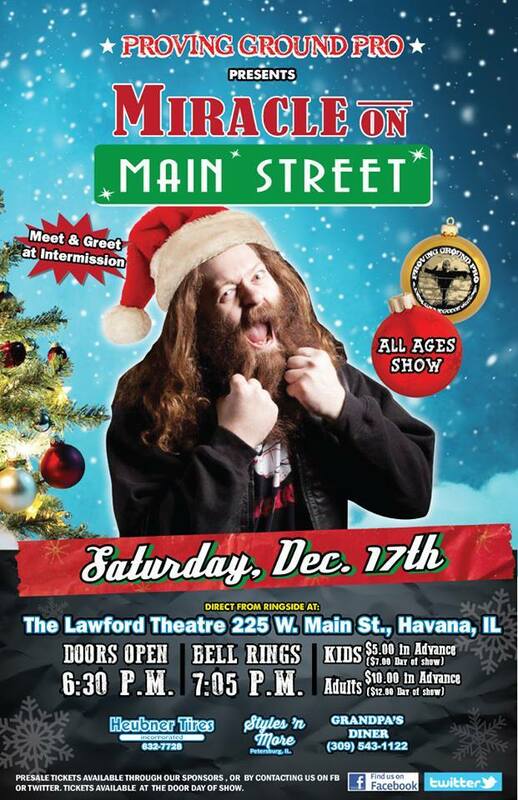 December 17th history is made at the Lawford Theater (225 W Main Street, Havana, IL) with MIRACLE ON MAIN STREET … Doors open at 6:30 PM and the MIRACLE starts at 7 PM. $12 adults and $7 kids or save a couple bucks with $10 adult and $5 kids advance tickets are available in Havana (at Grandpa’s Diner) and Petersburg (at Huebner Tire or Styles & More). If you can’t get to an advance ticket outlet message us on social media (Proving Ground Pro on Facebook and @pgpwrestling on Twitter) and we’ll get you hooked up. December 17th sees the return of PGP Tag Team champions Alpha Class (Danny Adams and Paco Gonzalez) to the Lawford Theater (225 W Main Street, Havana, IL) for another title defense. The astounding rise of Alpha Class has become the stuff of legend in the Proving Ground showing just how high you can climb with talent, hard work and determination. 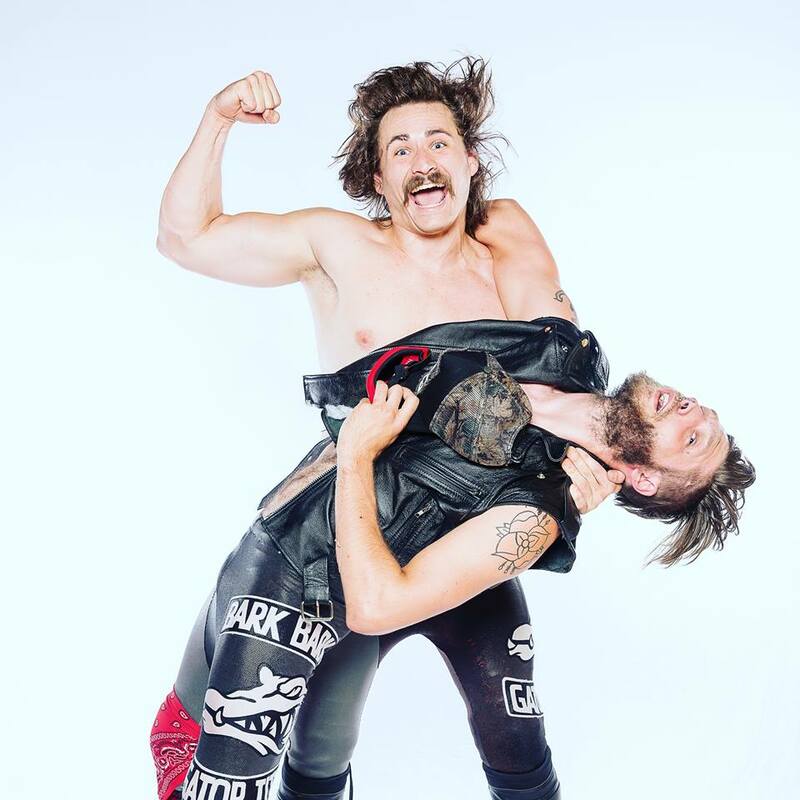 Speaking of legends, once upon a time the amazing Krotch pulled off perhaps the most improbable victory in PGP history by defeating the massive Nate Redwing and earning a shot at the PGP Tag Team Titles. 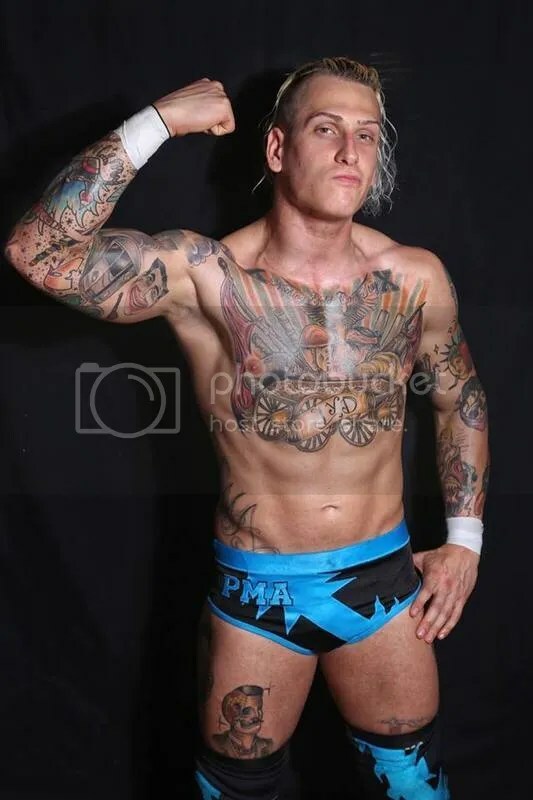 It took a while and the titles have changed hands since Krotch started his search….But Krotch has contacted us and will cash in with Dante Leon as his partner versus Alpha Class at MIRACLE ON MAIN STREET. 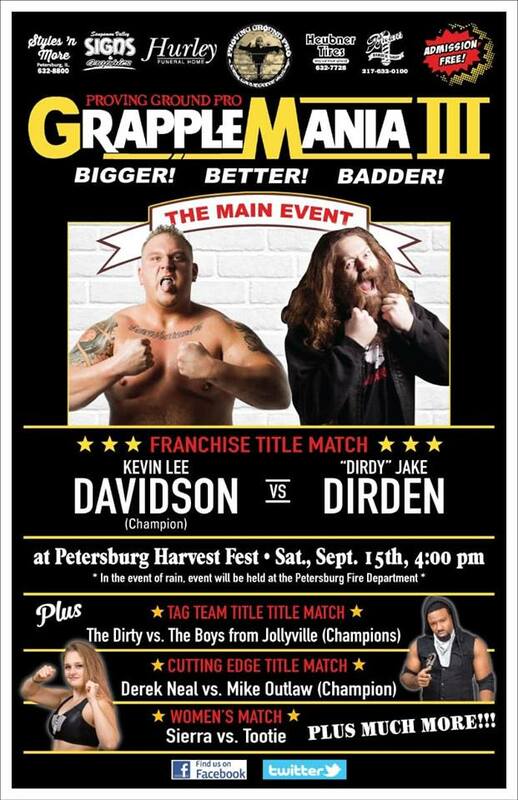 This will be high octane offense and sizzling speed on display in this potential show stealing match up that needs to be seen by you…Yeah, YOU…..BE THERE!!! December 17th (Saturday) will be a classic night in the Proving Ground when MIRACLE ON MAIN STREET presents this mind blowing Buckley Memorial Tournament qualifying match…”Leader of the Pack” Stephen Wolf damn near beat Jake Dirden for the Franchise title at our last show, although he came up short Wolf once again showed he’s ready for prime time. Timmy Lou Retton is a star on the rise with one of the most entertaining styles of wrestling you can find. Blending a dynamic high flying gymnastic based assault with impressive mat skills has forced both fans and opponents to take notice of the impressive Retton. Timmy has collected hardware and found his way to several main events already in his career, now he’s looking to put a Buckley Tournament entry on his resume as well. 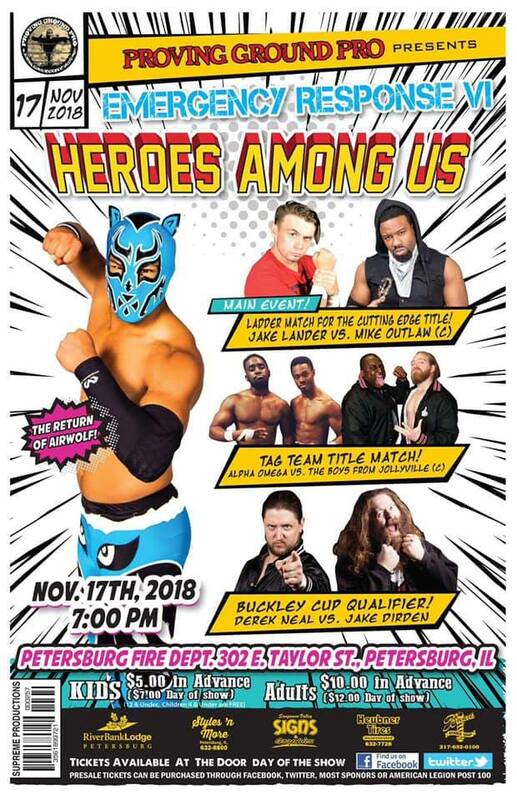 If you’re a fan of independent wrestling “Dream Matches” then Stephen Wolf versus Timmy Lou Retton is an early Merry Christmas present because you can’t wrap awesomeness….Oxygen masks and flight suits may be mandatory for this match….SONIC BOOM!!! 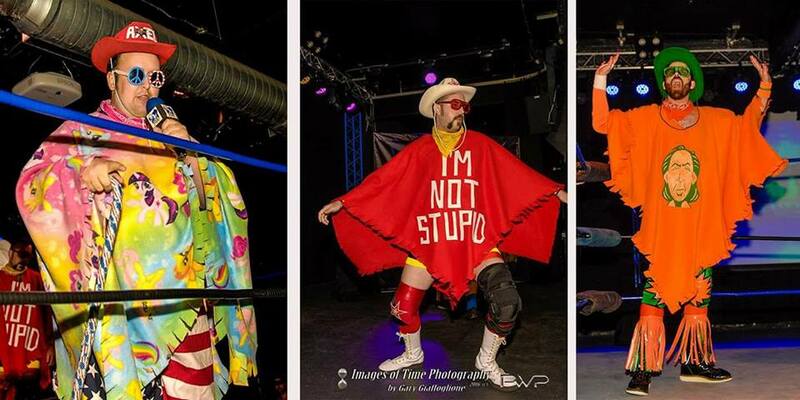 For big deal moments in independent professional wrestling… ENTER THE PROVING GROUND!!! 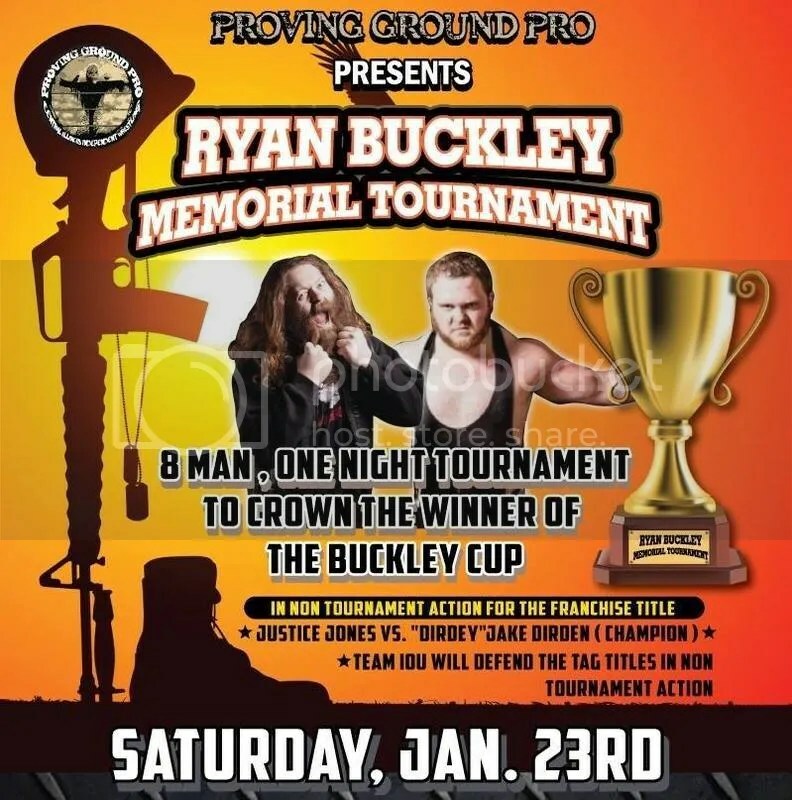 The 2nd Annual Ryan Buckley Memorial Tournament is set for January 23rd at the Petersburg Fire Department (302 E Taylor Street, Petersburg, IL) with a field of 8 amazing independent wrestling talents vying to win the coveted Buckley Cup. 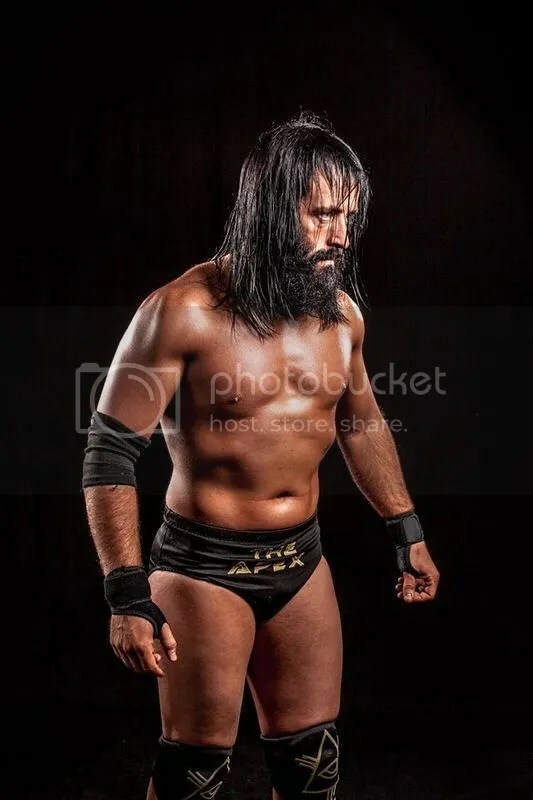 Our first entrant originally won a qualifier over the massive Justice Jones under the name Abe “Action” Jackson but since that time a change in name and attitude have given us Idris Abraham. This really is a wild card in the deck now, Idris was already exceedingly skilled, but a heightened level of aggression brings a new element of danger to his game. How this new attitude fairs on January 23rd or how it plays with the PGP fans remains to be seen, but rest assured Idris Abraham is bringing a top shelf quality fight to the Ryan Buckley Memorial Tournament. The second entrant in the field of 8 is the “King of Southern Strong Style” Jeremiah Plunkett, off a huge qualifying win over Ruff Crossing in a brutal, heavy hitting war. Plunkett is double tough and well traveled, but a devastating shoulder injury derailed his climb through the indy ranks. Back in action Jeremiah has managed to reassert himself with his signature physical, high impact style that creates success and opportunity. Capable of bringing the fight all night long, this man has a very real shot at wining the Buckley with his old school badass beat you up style. Expect 2016 to be a big year for Jeremiah Plunkett!!! Entrant number 3 in the field of 8 is last years winner “Bad Wolf” Blake Edward Belakis who comes in off a qualifier win over Mallaki Matthews. Belakis parlayed last years win into a huge 2015 including the PGP Franchise title. The Bad Wolf is on the hunt for his second consecutive Buckley win with this year bringing him in more experienced and dangerous than ever. Add in the Carnivore Club that Belakis is currently leading (along with Nelson Sixx, Stephen King and Nate Redwing) and you see just how well prepared Blake has himself for the field. A proven track record and formidable backup has Belakis looking like the favorite to win the 2016 Buckley Cup. Tenacious, tough and task focused paired with a vicious mean streak make Blake Belakis a must see in tournament action!!! The at large invitations are here…The 4th entrant for the Buckley is the fastest rising indy star in New York City….Rude Boy Riley!!! If you don’t already know the name you will soon, because he’s that damn good. 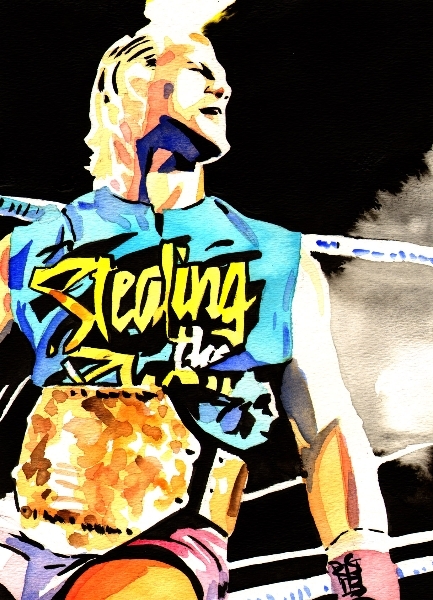 Currently holding both Tier 1 and Warriors Of Wrestling championships validates the talent level of Rude Boy. Commanding the spotlight in a star crowded upper East Coast validates his in ring charisma. Riley caught the eye of PGP at the FIP 6 Man Showcase where he was the heart and soul of Team Tier 1 and perhaps the standout performer of the entire tournament. Once again Riley has the chance to excel in a tournament format, making his way to the Proving Ground for a shot at the Buckley Cup. Expect this man to impress because Rude Boy Riley is real deal awesome. He calls himself Mr. 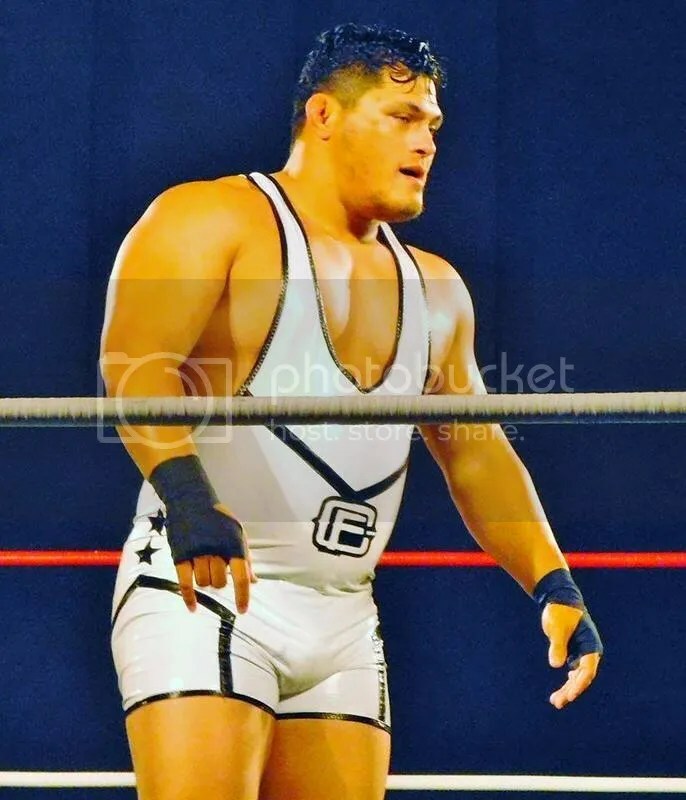 Athletic for a good reason, he’s Mr. Everything inside the squared circle and set to make his Proving Ground Pro debut.. Jeff Cobb!!! This is a flat out amazing athlete, if the term “suplex you out of your boots” holds any sway, you’re in for a treat. If the term “former Olympic wrestler” holds any sway, then the 2004 flag bearer from Guam is your cup of tea… So you’re saying this guy is Olympic level good with suplexes that will blow your mind??? YES, yes I am…But wait, it gets even better…How do you like crazy top rope high risk offense??? Yeah, Jeff Cobb is bringing that too…Seriously, Jeff Cobb is truly the complete package, a nearly flawless mat game, freakish strength, spookiest suplexes going, top rope high flier and all around athlete…DAMN. By the way, if you’re a fan of Lucha Underground you might want to keep an eye out for Matanza, just sayin’. The Buckley Cup just got a game changer folks, Jeff Cobb is set to make his mark in the Proving Ground!!! The field of The Buckley just got a lot bigger and a lot more powerful with entrant #6…Odinson!!! This is the truest rookie in the field, but what he lacks in veteran savvy he more than makes up for in raw, unbridled power, Odinson is otherworldly!!! 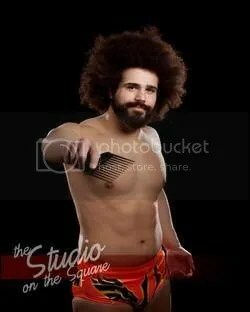 Coming out of WWA4, this supremely gifted athlete is set to take the wrestling world by storm. The bottom line in professional wrestling is the fact it tends to be a big mans sport. Hard truth is there’s no easy answer to overcoming size and strength, take the Incredible Hulk for instance, the phrase “Hulk Smash” made all the sense in the world because it’s simple truth that you can’t dispute. Hell, Pantera went and made a badass album called Vulgar Display of Power..The parallels are obvious. Trust in this, you don’t want to miss the Proving Ground debut of Odinson, from Asgard to Midgard ( Bifrost bridge tolls not withstanding) the 2016 Buckley is truly the multidimensional sensation of 2016!!! International star Tyson Dux returns to the Proving Ground for another shot at the Buckley Cup. Last year Tyson turned in an unbelievable match against Justice Jones, but suffered a tough loss in a physical match. This year Tyson returns more determined than ever to use the Buckley to kickstart his 2016 in style. Even though he’s the most professionally accomplished competitor in the field, there’s still plenty of goals left for Dux, and the Buckley Cup is just one of them. With world tours and stops with all the bigger companies, Tyson is still looking for that difference making run in one of the majors. The talented athlete from Windsor, Ontario possesses all the tools and well honed skill to make it happen, that’s a fact. A great resume is no guarantee of success in PGP, Tyson knows that first hand, so you can be sure Dux is coming in with a rock solid game plan and plenty of fight to back it up. 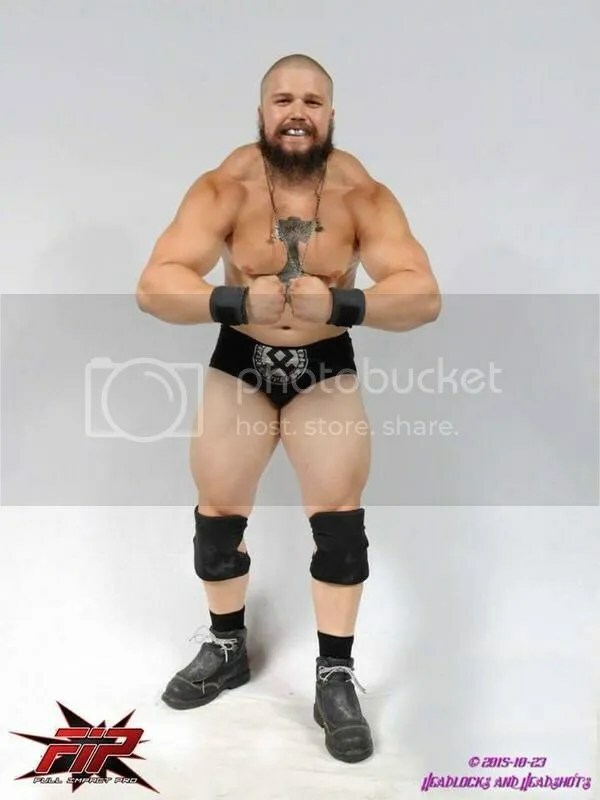 Some competitors hit the Buckley looking for a breakout year, this is a man looking to cement a legacy as a premier world class professional wrestler. Partly a goal he’s set and part unfinished business from last year, rest assured Tyson Dux will be determined and dangerous in this tournament format. Perhaps the worlds most technically sound performer, Tyson Dux just upped the ante in the 2016 Buckley!!! The final entrant in the field of 8 for the 2016 Ryan Buckley Memorial Tournament is the longest reigning Franchise champion in Proving Ground Pro history…Ruff Crossing. Why Ruff Crossing doesn’t have a full time gig in New Japan is anyones guess, this is the most badass cowboy to hit the ring since Stan Hansen, that’s flat fact right there. Everyone who sees this man in action instantly realizes they’re witnessing something special. Extremely tough, great mat game, can brawl with anyone, amazing resilience and a whole lot of gas in the tank, Ruff Crossing is serious business inside the squared circle. 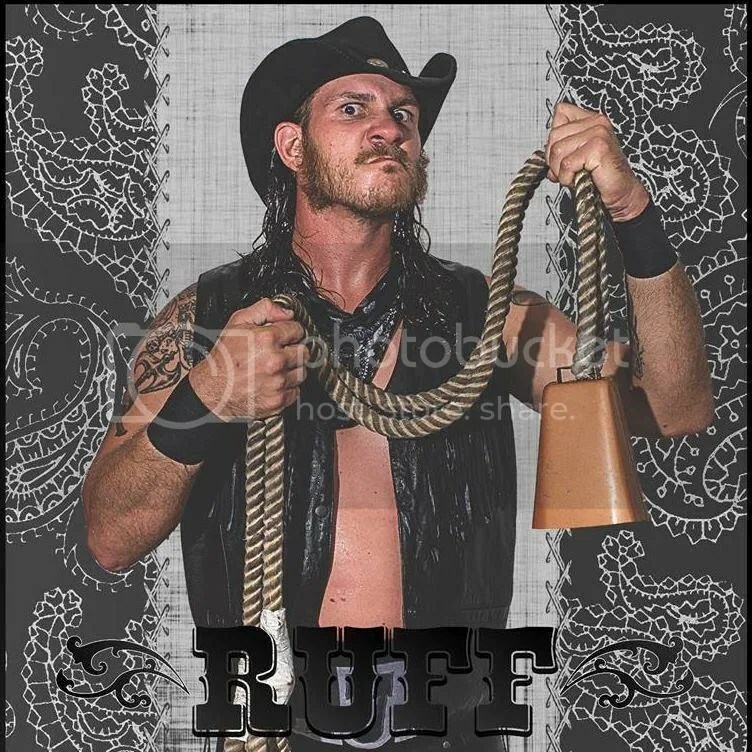 Truly a complete package and more than capable of beating anyone in the business on any given night, Ruff Crossing has every tool needed to win the whole damn tournament!!! 8 premier athletes are set for a brutal night of competition at the 2nd Annual Ryan Buckley Memorial Tournament, “America’s Favorite Son” is looking to win it all. dris Abraham, Jeremiah Plunkett, Blake Belakis, Rude Boy Riley, Jeff Cobb, Odinson, Tyson Dux and now Ruff Crossing rounding out the entire 2016 Buckley Tournament field. This is an amazing array of talent descending on the Proving Ground looking to take home the Buckley Cup…Folks, this is serious indy awesome that’s bound to be mind blowing action!!! Along with this spectacular tournament you’ll also be getting 2 PGP title matches…..Franchise champ “Dirdey” Jake Dirden meets #1 contender Justice Jones in a titanic clash for the belt AND tag champs Team IOU (Nick Iggy and Kerry Awful) are in action with a championship match as well…Keep a sharp eye on Proving Ground Pro for Team IOU’s opponent and any other developing news for the 2nd Annual Ryan Buckley Memorial Tournament!!! Not only a fantastic show, it serves a worthy cause, ticket profits and Video On Demand buys will benefit Wounded Warriors Outdoors in the tournaments namesake, Ryan Buckley. Our friends at WWN Live Network will carry the 2nd Annual Ryan Buckley Memorial Tournament available Video On Demand and all buys will benefit Wounded Warriors Outdoors in the name of Ryan Buckley. Indy Power Rankings will be in the house to call the action and lend a hand promoting all the great Buckley action, another indicator this is a serious independent wrestling event. Whether you’re a serious or casual wrestling fan, The Ryan Buckley Memorial Tournament is not to be missed!!! Grab that old school paper calendar and circle January 23rd RIGHT NOW!!! 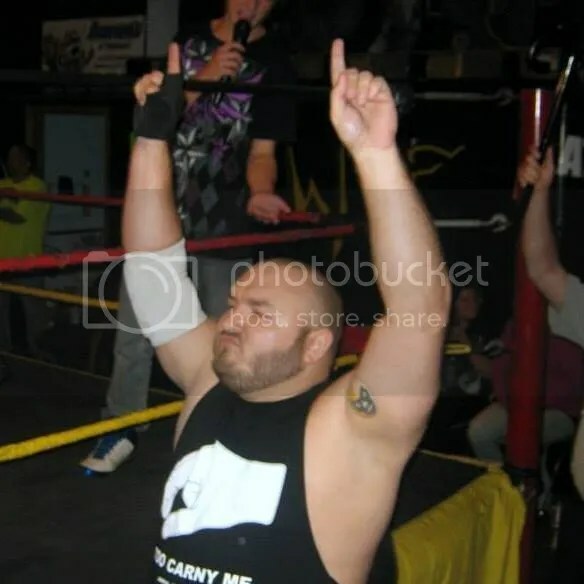 The 2016 Ryan Buckley Memorial Tournament takes place on January 23rd (Saturday) at the Petersburg Fire Department (302 E Taylor Street, Petersburg,IL) with doors opening at 6:30pm and the Buckley starting at 7pm. Tickets are down right affordable, only $12 adult and $7 kids is all it takes to get a great show and help a great cause…Post holiday budget strapped? 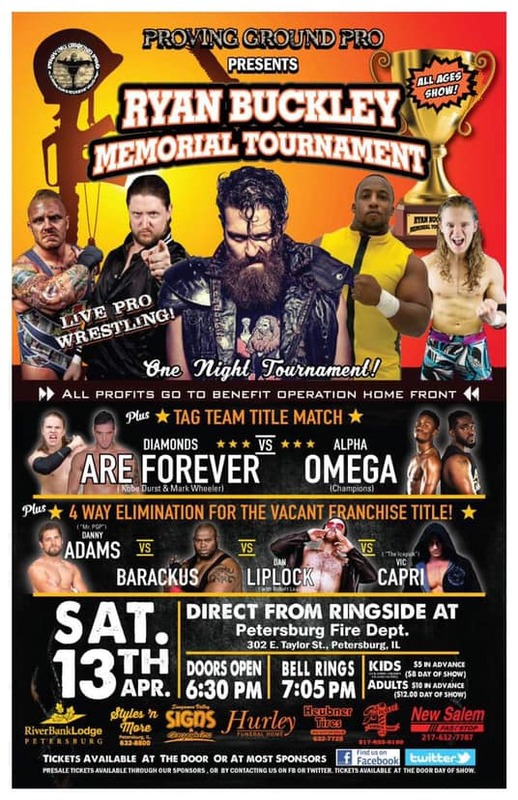 We can help with $10 adult and $5 kids tickets available in Petersburg at Styles & More, Huebner Tire or the Fire Department until day of show. Can’t get to Petersburg to purchase advance tickets? Message us here and we’ll hook you up!!! 8 serious professionals are putting it all on the line to win the 2016 Buckley….Competition like this can only be witnessed when you…ENTER THE PROVING GROUND!! !